This menu at Noble Experiment in San Diego was printed on vintage letterpress equipment. It’s 1915. You walk into a bar and ask the bartender for a cocktail menu. The bartender looks at you with grave suspicion. If you don’t know what you want to drink, why did you walk into his bar? You must be either troubled or looking for trouble. This last menu is actually what you would have been handed had you walked into Callooh Callay, a bar in Shoreditch, London. It’s a place widely noted for its unusual cocktail menus, which seems wholly appropriate for a bar named after a line in Lewis Carroll’s Jabberwocky. “It’s great seeing people on a date break the ice by discussing the drinks list, people taking photos and interacting with it, or giggling with the staff over the design,” says Rebekkah Dooley, who for six years designed menus for the lounge. Her other menus have taken the forms of a newspaper, a Pantone color wheel, a transit pass, a sticker album, and an Ikea assembly manual (“How to Cönstruct Yöur Perfect Night Öut”). The bar took home the “world’s best cocktail menu” of the year award at Tales of the Cocktail in 2012. The stoicism of the menu began to fall away following Repeal. For starters, drinkers had to be re-educated. And technology abetted creativity. “Printers encouraged the use of three-dimensional stand-ups, die-cuts, and various eye- catching devices to boost drink sales,” wrote menu historian Jim Heimann. What’s more, bars found they could use menus to prod consumers toward more distant horizons, generating excitement before the first sip was taken. The chatty, eye-catching cocktail list was born. And then came the full tiki love-embrace. Menus became as elaborate as the faux-tropical bar settings—with glossy illustrations of flaming drinks, palm trees and bamboo everything, along with wry commentary. In 1936, Restaurant Management magazine wrote that a chief goal of the menu was “to repeat, emphasize and accent the whole atmosphere you are trying to sell.” Tiki did this best. Some of today’s menus make the tiki era seem positively sleepy. The goal is often not just to accent the bar’s atmosphere, but to get Instagrammed and to spread the word about adventures to be had. Paper engineer Helen Friel and illustrator Joe Wilson designed an extraordinary pop-up menu for The Beaufort Bar￼￼￼ at the Savoy in London. 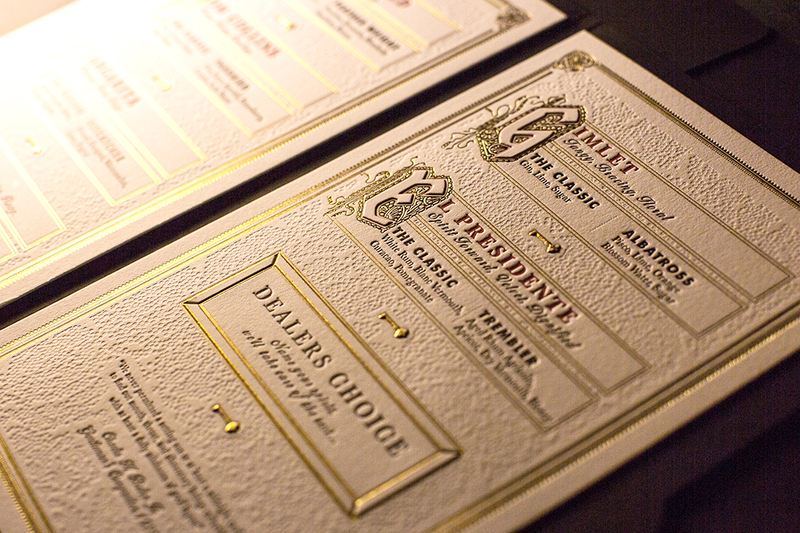 In San Diego, Noble Experiment released an elaborately designed menu printed on antiquated letterpress equipment, appealing as much to touch as to sight. 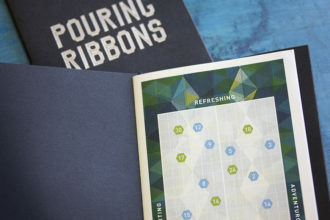 Pouring Ribbons in New York City worked with design firm Warren Red to produce a gameboard-like matrix allowing drinkers to position themselves on the axes between “comforting” and “adventurous,” between “refreshing” and “spirituous.” This was followed by a Route 66–inspired drinks list. 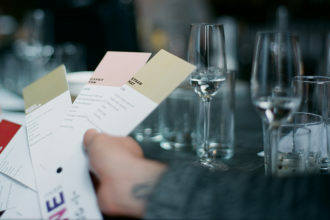 And in San Francisco, Trick Dog (and the bar’s creative team, The Bon Vivants) rolled ￼￼out menus inspired by pantone charts (pictured above), Zodiac signs, a Chinese takeout menu, and a map for tourists. Other drink menus become vehicles for storytelling. Atlanta’s new Ticonderoga Club launched with a 28-page faux sporting journal-as-menu, reminiscent of something you’d expect to find in a private club circa 1910. There’s a knot-tying instruction, a crossword puzzle and even a welcoming letter from “president” David Wondrich. So the next time you walk into a cocktail lounge, be sure to ask for the cocktail list. If you don’t, everyone will assume you’re either troubled, or looking for trouble.